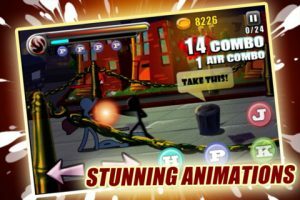 Ultimate Stick Fight is an iPhone game developed by Dragon Nest Studio. 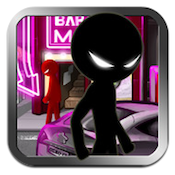 You play as a Stickman who needs to take back your beloved city from the Dragon crime family. Playing Ultimate Stick Fight feels like a trip back in time: the controls are set up just like a classic arcade game. Your left thumb moves you backwards and forward across the terrain, while an assortment of buttons on your right hand side let you kick, punch, hold, and jump. Use them in the correct order, and you unleash some cool combo moves. As someone who grew up playing arcade games, I felt an immediate attachment to the game simply because of the controls. It’s classic arcade action at its finest, but with unique graphics. Plus, you’ve gotta love any kind of game that lets you pick up a dumpster over your head and toss it nonchalantly in the general direction of your enemies. There are three levels of difficulty that you can play at, across 40 different levels and 8 cool environments. 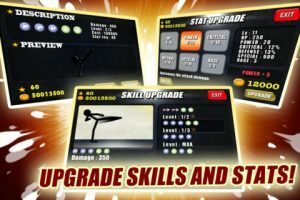 In addition, you can upgrade your skills and stats as you go along, which makes the game a lot more addictive. It’s worth noting that if you close the app for too long, you won’t be able to resume the game mid-level. In other words, to enjoy the game the fullest, make sure you finish each level before pausing for a bathroom break. 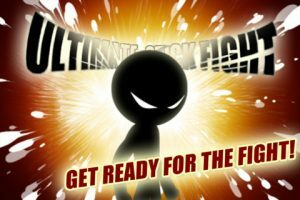 Ultimate Stick Fight has a great difficulty curve, and that goes a long towards keeping the game fresh and exciting. There’s no rush quite like fighting off eight guys at once, and Ultimate Stick Fight is a truly adrenaline-pumping game. 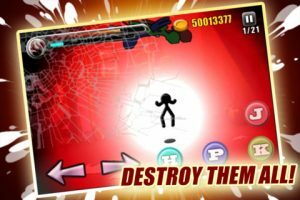 For 99 cents, you can’t do much better than this arcade-style action title. Ultimate Stick Fightis compatible with iPhone, iPod touch, and iPad. Requires iOS 4.3 or later.